If you’re a secondhand shopper, chances are you thrift at least in part for the monetary savings. But what if the allure of inexpensive, quality finds is actually causing you to spend more? Reader Ginna from Feet Chic and I recently convened a digital conversation about how much our beloved thrifting habit costs us. In this wide-ranging conversation, we cover how we got into thrifting, how we think about hits/misses, and blowing our retirement funds, and much more. Take a read through Part 1 below – and scroll down to chime in! Leah: I definitely agree with you re: discretionary spending and it being a hobby. I’ve been thinking about scaling my habit back to be able to put more money towards social justice/charitable causes…. Though of course Goodwill is a good cause! From your perspective, what are the pros/cons of spending your clothing $$ on thrifting? In a way, I DEFINITELY save money because I buy really expensive styles when I thrift. On the other hand, I would never buy designer clothes retail, so in a way I’m just upgrading my wardrobe with things I wouldn’t buy otherwise. BUT even thrifting designer jeans for $25 is cheaper than buying brand new crappy Old Navy jeans for $70. SO…. On top of that, my jeans size fluctuates a lot, so thrifting has allowed me to buy 2 sets of jeans, one for when I’m at my low weight and one for when I’m at my high weight. Thrifting has also allowed me to change my look around more than I normally would. I realized this year that the light colored items in my wardrobe were making me look washed out, so I’ve been slowly phasing those out for more dark gray / navy tops. Leah: Thrifting has definitely let me play with color – it’s given me permission to jettison all my black stuff (I think I have the opposite coloring problem you do!) without making me feel guilty about dropping tons of money on replacements. There was definitely a learning curve at the beginning where I bought a lot of stuff that didn’t work out. I still do this sometimes, especially buying ‘special occasion’ clothing that I love the idea of (but my lifestyle is very casual, so that stuff usually ends up getting re-donated after a while…). Ginna: BUT people do this with retail, too, so it’s not a problem that’s isolated to thrifting. Because I’m shopping more than I normally would and am trying to think outside the box, I do buy things I wouldn’t normally buy. About half the time these end up getting re-donated at some point, and the other half of the time they work out and I enjoy them. One example of this is a tuxedo-style vest that I bought because it fitted perfectly and was $5. I ended up wearing it to my office Christmas party *and* now rotate it into my wardrobe regularly. 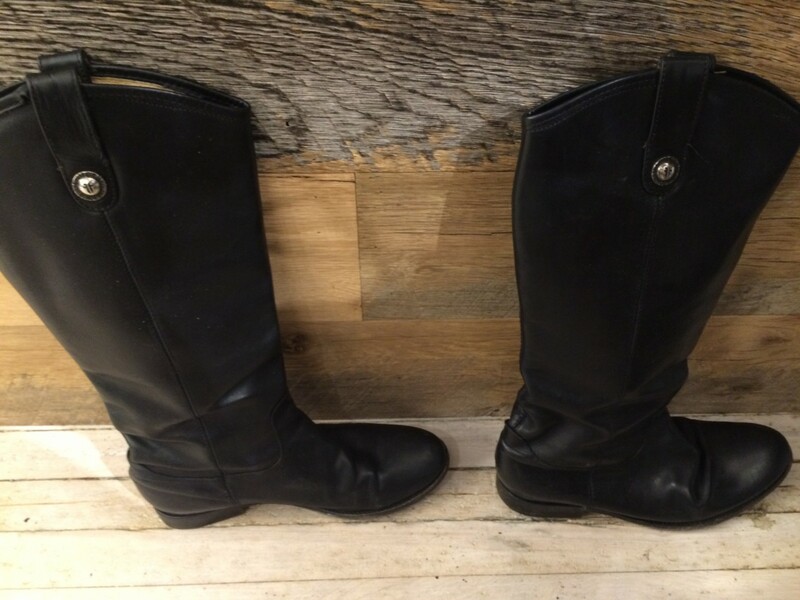 ^^Boots I bought against my better judgement because… They were Frye brand but 95% cheaper. They fit but could have been a bit more comfy… and the friend I was thrifting with loved them. Day 1 of wearing them, I remembered why a great deal is only a great deal if I will wear the item, regardless of a friend’s opinion. My feet were aching from lack of cushioning. There was no day 2 with these. How do you think about this stuff? Is there a magic equation to determine how much money I’m saving (or not saving…)? Leah: I haven’t really thought about the $ for a pair of shorts I don’t keep going into the cost of the pair I *do* keep… That’s a really good point. I tend to think of it as “I paid $6 for this dress, great deal” and the stuff that gets donated back as, well, charity. Budget-wise, though, you’re exactly right. I guess how I try to combat this is not buying things that don’t work. I’m getting better at this but I definitely still have misses. Ginna: Here’s one way to think about the question: According to BLS, the average New Yorker spent $2,338 on clothing and clothing services in 2014. (Of course, their average New Yorker is 51 years old and could be male or female. I bet women my age – 30 – spend a lot more than this…). So if I add up my thrifting plus anything I bought new plus tailoring, did I spend more or less than this amount? I’d guess that my spending was right around this average or slightly below it, but I’d have to add it all up to know for sure. Leah: I don’t buy new and rarely tailor so I’m pretty sure I don’t spend nearly as much as the BLS figure… factor in that I live in Atlanta where the vibe is definitely less clothes-horsey (at least outside Midtown/Buckhead), so I would assume the average amount is somewhat lower. But I’d still rather not do the math on my own spending! Which probably means it’s higher than it should be. Ginna: I am scared to find out how much I spend per month! What if it’s some astronomical number and I walk away from the computer thinking, “WOW. GOODBYE RETIREMENT”? Leah: Oh boy, maybe we need to give up thrifting for a year and put everything we’d spend on clothes into our IRAs. Your turn! Do you really save when all is said and done, or does the low cost of thrifting (and the thrill of the hunt!) justify a spending habit? Scroll down to share! Thrifting is my hobby: “the thrill of the chase”! However, that said, I don’t overdo, thrifting less than once a month and spending usually about $20 or even less (I’m living in the South where thrift shop prices are undoubtedly lower). Although I do sometimes end up re-donating a garment, I feel I’ve had the fun of trying out a new style, shape or color for a low investment. In addition, since I’m a pear shape with a small waist, I have difficulty finding a pair of pants that don’t gap at the back. “Vintage” pants often fit much better making me feel justified in my thrift spending. AND used clothing is usually “pre-shrunk” so there won’t be any surprise after laundering. Carol, sounds like you have a pretty good rhythm down! I love that thrift stores let us access silhouettes/cuts that aren’t “trendy” right now – hadn’t thought about pant waists in particular but it makes total sense! I’m a big fan of the pre-shrunk factor, too. If it’s not new with tags you have some sense of how it will wear in the long run, which is hard to get from retail items that no one has owned for very long. Thanks for commenting! I too think of it as a treasure hunt. Something not talked about is the misses I used to make at full price that hung in my closet which were very costly. Then you have the guilt and don’t remove them as fast so even though you have a garment you still have a “hole” in your wardrobe which makes your wardrobe less efficient. The more I thrift the more selective and critical I am of anything that comes into my closet. Quality, condition and fit have to be 10’s. I do try new styles and often those get re donated, but I haven’t spent a kings ransom to try something new. I have also switched to cash for my thrifting which psychologically makes it harder to part with my hard earned dollars. Gina’s remark about the two sizes struck a chord with me. It seems I never get down to what I actually want to weigh, but I still need to wear presentable clothing, so thrift shopping allows me to have a wardrobe without investing a lot of money. I always tell myself that when I reach my desire size, THEN I’ll go retail shopping. (Not likely!) Also, after the recession, I was broke for several years. It was pretty depressing. But the fact that I could go to a thrift shop and buy something for myself or my house for just a few dollars was a big consolation. Sometimes the charity itself sways my decision whether or not to buy something. If it’s helping the homeless, hungry, overseas medical missions, etc., I often feel pretty good about spending money at a particular shop. The charity/non-profit aspect is one reason I patronize thrift stores over consignment shops – if my $$ are going to be spent on something I can’t return, I want them going to a good cause! Thrifting is such a great way to address closet needs that span divides like size (or you live in two very different climates, or you split your time between to very different lifestyles, or…). Much less $$ investment to cover a range of needs! Totally! I’ve fluctuated pants sizes every couple years since I hit puberty. The first few times I would buy a bunch of pants in the new size and get rid of the old ones, thinking, ‘I’ll never be that size again.’ Now, after maybe 8 or 9 times going through that cycle, I’ve wised up and keep labeled boxes with the two pants sizes (mostly thrifted). I budget like a hawk and I have the data since 2011. While I haven’t switched to thrifting exclusively, I have shrunk the household clothes budget (we’re on track to spend in 2016 less than 15% of what we spent on clothes in 2011). This is due to several things: more thrifting, buying repeats of clothes/shoes I know will work in secondhand places like eBay or Craigslist, and wearing every last stitch out of the clothes I pay full price for. That means many of my nice work pants are on their last legs, and have had to be re-hemmed/patched, but I have an in-home seam-ster? for that. It also means I may have to shell out for more pants soon, but they’ll last another 5 years of hard work. Yeah, the downside of having several staples burn out at the same time is that you then have to budget to replace them all at once…but thrifting/eBaying does help with that! I’ve also fallen prey to thrifting items because they were cheap and a fancy pants brand that actually turned out to be uncomfortable or not me, like your friend’s Frye boots. It’s sort of distressing to realize that actually, on some level I do care about brands/labels. Really trying to get over that. As I’ve gotten more specific over the last couple of years about exactly what I want to add to my wardrobe (in terms of color/style/fiber content) I’ve moved away from true thrifting a bit — so now, going to thrift stores (by which I mean Goodwill, Value Village, and the like) is really a lark done for the thrill of the hunt. And I’ve turned to sourcing more of my wardrobe staples secondhand online, mostly via Ebay. I know I was just singing Ebay’s praises to you, and I do think it can be a great tool, but one thing I’ve noticed is that because it’s online you can essentially be shopping anytime/all the time. And I also wonder about the degree to which searching for items — both sifting through the results of relatively broad searches to find what I want, and the ability to find incredibly specific things very quickly — essentially just ends up manufacturing desire. Hence my recent turn to trying to focus on what I can do with what I already own. I’m definitely not perfect in that department though! Fascinating observation about manufactured desire…I think a little of the latter can happen when thrifting but definitely not on the same scale. I experienced the allure of 24/7 shopability with that ThredUp experiment – “all the clothes!! right here for me to peruse and potentially buy!” I’ve actually grown to like the delayed gratification of thrifting as a long game and something I can’t do instantaneously – like waiting until your birthday to open your presents. But online is definitely convenient! I’ve been thrifting to save money while getting my kids through college. It’s fun and I do save money. I am in the process of gearing up to go back to work after almost 25 years. So I’ve been buying work clothes at thrift shops. Via spiga new shoes for $5 instead of $200 is a bargain for me. I’ve found lots of items for 25 cents. Everything I cast off gets donated and I love the no tax factor. Lana, sounds like you are in a good thrifting area! I’m jealous of the $5 shoes!! Thrifting is definitely a great way to prepare for a lifestyle change like going back to work! Thrifting is so great for clothing a big lifestyle change in an affordable way. Glad you’re having fun and saving $$ while doing it!